People Who Make a Difference! EMMA WOLF -Emma is a grade 3 student at McGregor Public School. She consistently helps others with various tasks a daily basis in the classroom, assists others with problem solving in the classroom and the school yard. She manages the computer tech in the classroom and is always the first to offer a helping hand. She is an AMAZING girl with a strong moral compass and is very respectful to everyone. RAYYA McLEOD- Rayya is a grade 8 student at Davenport Public School. She is a member of Me to We and is passionate about local and global concerns. She is a leader, an individual who is socially conscious and she ‘walks her talk’. Rayya was key in organizing Davenport’s SCARE AWAY HUNGER food drive at Hallowe’en and heads the composting program. LIZ McCONNELL and SUE ZIMMER…..The Helping Hands Award is in recognition of their leadership and efforts with both the Corner Cupboard and Christmas Care, two very much needed organizations in Aylmer and the surrounding area. THE HUESTON FAMILY- The Hueston Family is very well known in the community for their Biggest Little Newspaper in Canada and their extensive publishing firm(s) throughout the Province. Patriarch, Art Hueston started the Thanksgiving Food Drive for the Corner Cupboard 30 some years ago. The drive continues today. The Family and the Express are long-time sponsors of local hockey and soccer teams and give financial support to APAC, The Optimist Toy Drive (and I am sure many more needs and activities within the area).The family founded the 3 Port Tour bicycle event in 2011 which has raised approximately $70,000 that is split between the EESS Environmental Leadership Program and the Forest City Velodrome. The Huestons are also multigenerational presidents of the Aylmer Kinsman Club. Their generosity and community support extends beyond Aylmer and Area to London, Woodstock and Toronto where they have expanded businesses. O’NEIL’S FINE JEWELLERY- For the past 17 years, Lana and Dennis O’Neil have sponsored a Christmas Angel Program donating all proceeds to the Aylmer Area Community Foundation. Their generosity, as with all donations received by the Foundation, has touched the lives of many in this community. As well as their outstanding support of the Foundation, the O’Neils also contribute to the Corner Cupboard, the Shriners, Minor Hockey, Ducks Unlimited, the Fireman’s BBQ, and several local church bazaars. Their willingness to support is exceptional! Join us in Palmer Park as we light the parks for the Christmas season! Everyone welcome on Friday, November 23, 2018 at 6:30pm. Thanks to Aylmer RBC and Miller’s Valu mart for their contributions to the lighting. The youth summer day camps are a great way for your kids to get out of the house, have some fun with other children and be engaged in activities. We are fortunate to have a great local community complex. Also, don’t forget to mark your calendar for the Canada Day celebrations at the East Elgin Community Complex! The Lighting of the parks is a true community project. Volunteers worked many hours to set up over 16,000 lights. Contributors to Aylmer’s downtown Christmas decorations this year were: MainStreet Aylmer -Downtown Merchants, Aylmer Area Community Foundation, Showcase East Elgin Realty Inc. Brokerage, ERTH Corporation, EESS Leadership Class, Joel and Betty Falkenham and the Town of Aylmer. The Community Decoration Committee: Diane Mott, Linda Black, Cindy Difaszio, Kim Enns, Wanda Kapogines, Jeneen Toth, Michelle Toth, Jeff and Nicole Wiebenga and Judi Wright. The lights are in Palmer Park, Balmoral Park and the Old Town Hall Parkette. 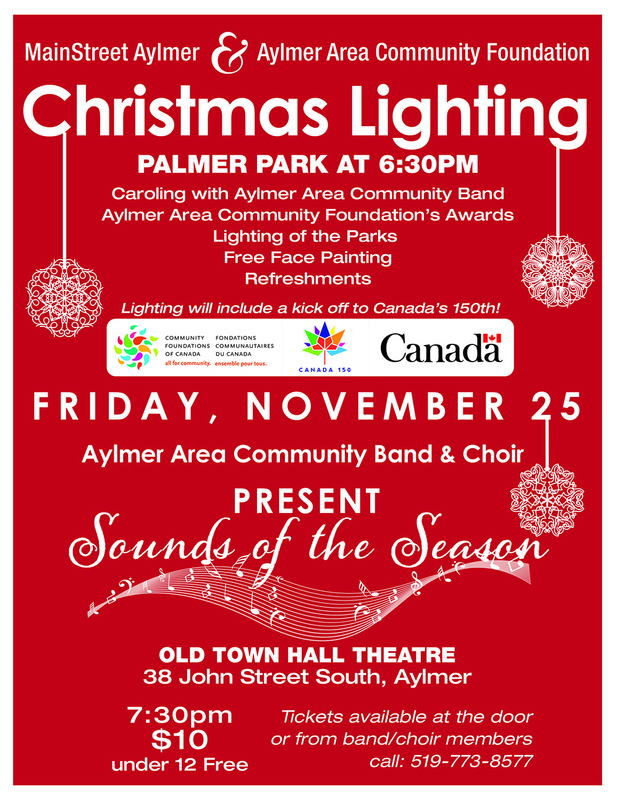 Thank you to the Aylmer Area Community Band, Miller’s Valu mart and Aylmer Royal Bank for their support at the lighting. This initiative is made possible by the Community Fund for Canada’s 150th, a collaboration between the Aylmer Area Community Foundation, the Government of Canada, and individual Canadians. 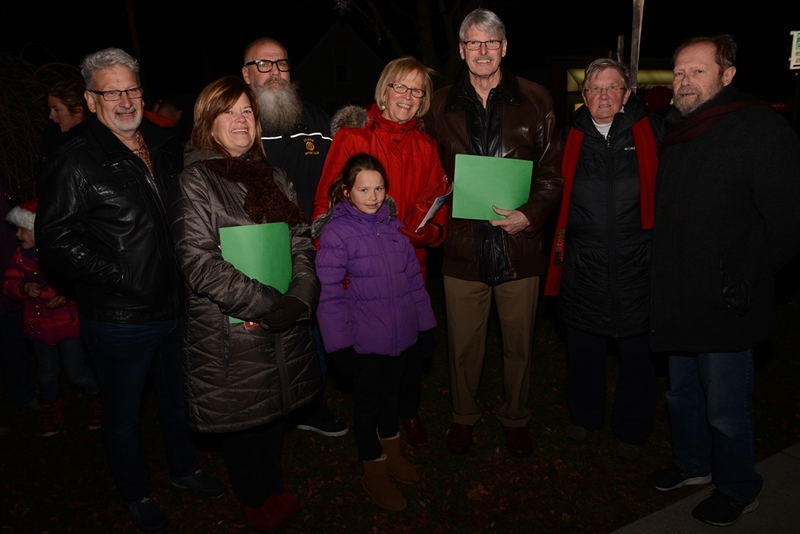 Recently at the Lighting of the Park, the Aylmer Area Community Foundation(AACF) presented very deserving local citizens with their ‘People Who Make a Difference’ awards. Every year, the Aylmer Area Community Foundation make a point of thanking local residents for their community support. Janna, Mike and Lynn Summers own and operate Aylmer Tire. They have a strong belief in community and are actively involved in contributing to its well-being. For the past several years they have given a substantial donation to the EESS Environmental Leadership Program. 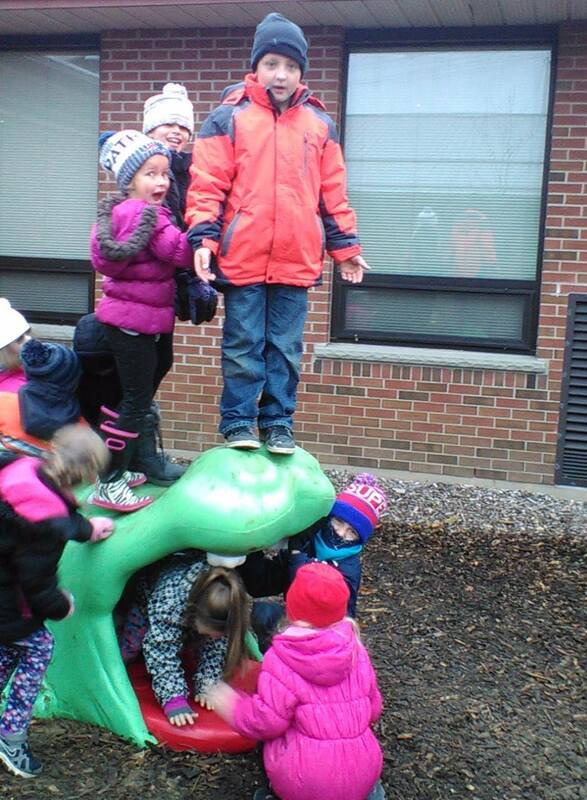 In co-operation with Tirecraft, they were very generous supporters of the Aylmer Splashpad. They also added their support to the East Elgin Community Complex, the United Way and the Corner Cupboard. Such generosity and caring deserves our community recognition. Dave has been an active member of the Aylmer Optimist Club for many years having served as president for many of those years. He is particularly proud of the difference the Optimist Club has made within the community. For the past ten years, Dave has organized a Bike Run, the Rotten Road Ride, donating all proceeds to the Optimist Club with the exception of an editions cause this past summer, A Smile for William. He organizes many fundraising events for the Optimists such as the Parade of Dimes at Christmas and a Toy Ride in September. Dave is a sponsor of the Animal Aide Cruise Night, held every Fathers Day. Dave was born and raised here and operates his business here. 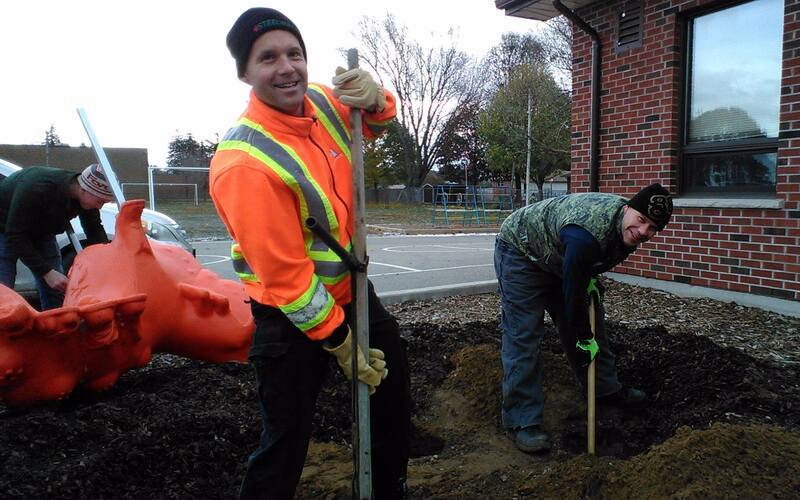 He is very proud of his community, the Aylmer Area and spends hours volunteering in many ways that benefit so many. He is a very caring, generous man and we thank him for his contributions! Mike and Brenda Streib have lived and worked in this community for many years. While they owned and operated their pheasant farm, they raised three children who have the same sense of community as their parents. They are the proud parents of 3, Sarah, who lives in Australia, Kate in Nelson B.C. and Chris, owner of Talbot Trail Physiotherapy and proud grand parents of 7. Mike is a member of the Aylmer Ducks Unlimited Men’s Committee and the local Order of Good Cheer. He is a Trustee at Aylmer Baptist Church where he sings in the choir. Mike is a member of the Elgin Business Resource Centre and represents the western region on the Ontario Business Resource Board. After a long association with Westminster Mutual Insurance, he has been appointed Chaplin of the Ontario Mutual Insurance Association. Mike is a former Kinsman and is very proud of his life membership in the organization. Mike chaired the 2017 EESS Reunion. Kenneth and a founding member of the Aylmer Wetland Susie’s, a former women’s committee of Ducks Unlimited. Brenda is a member of the St. Thomas Children’s Foundation and a former Director of the Y.W.C.A. Division. He was instrumental in making our local medical clinic a reality and a community jewel. His support also confirmed the inclusion of Life Labs in the facility. He is a supporter of Farm Town and works with Bridges Out of Poverty through the Y.W.C.A. Christine, Chris’ wife is also an avid supporter of Farm Town. She is a supply teacher at Faith Baptist Church School, a volunteer with Victim Services Elgin and Fresh Start. This is truly an Aylmer and Area family that we can be very proud of and grateful for their belief and support of our community! 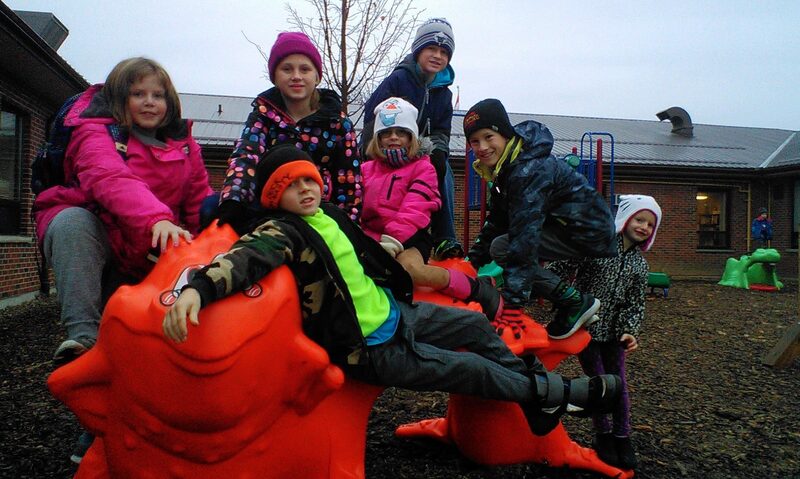 Here is a recent message from Immanuel Christian School in Aylmer who were a recent recipient of a grant through the Aylmer Area Community Foundation. We are pleased to partner with this community based project. This initiative is made possible by the Community Fund for Canada’s 150th, a collaboration between the Aylmer Area Community Foundation, the Government of Canada, and extraordinary leaders from coast to coast to coast. 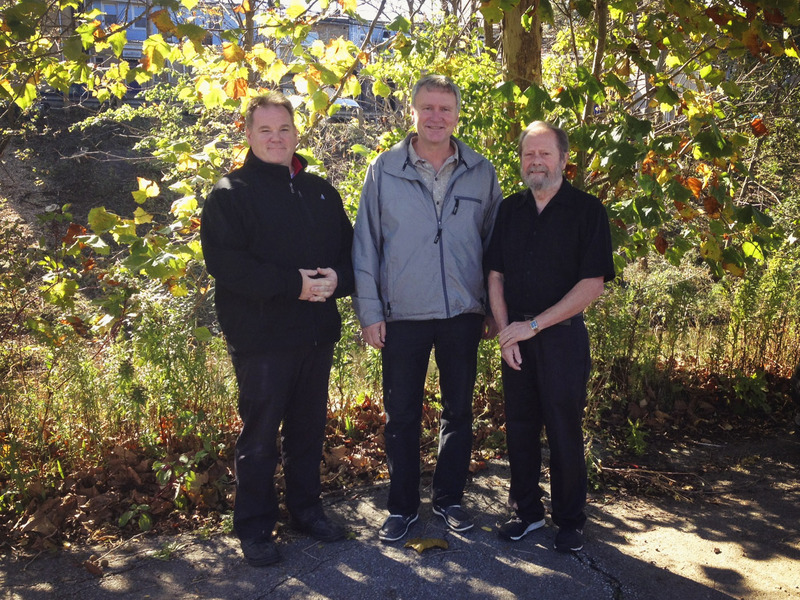 Martin Miller(left) and Jack Couckuyt(right) on behalf of the Aylmer Area Community Foundation presented Chair Kevin Cross(middle) of the Aylmer BIA $6000 towards their revitalization project of the Catfish Creek bank downtown Aylmer. Brush, garbage, invasive trees were removed along the bank and new native Carolinian trees were planted. The Aylmer BIA initiative was made possible by the Community Fund for Canada’s 150th, a collaboration between the Aylmer Area Community Foundation, the Government of Canada, and extraordinary leaders from coast to coast to coast. 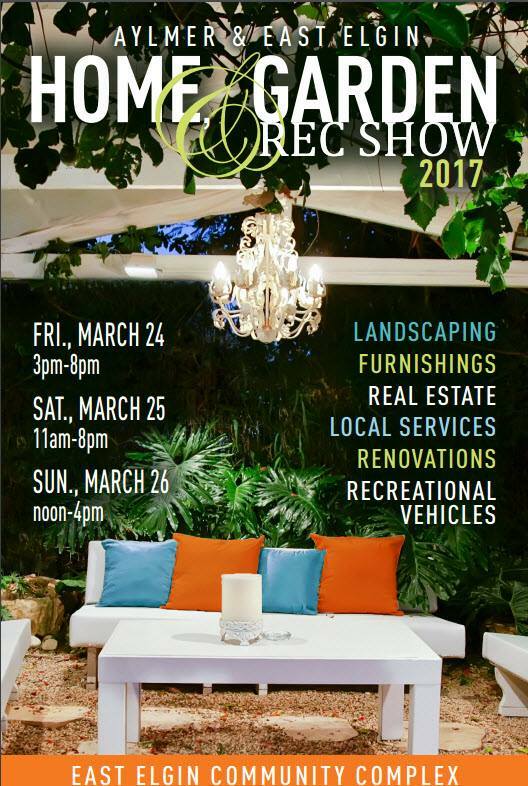 Aylmer Home, Garden & Rec Show this weekend! 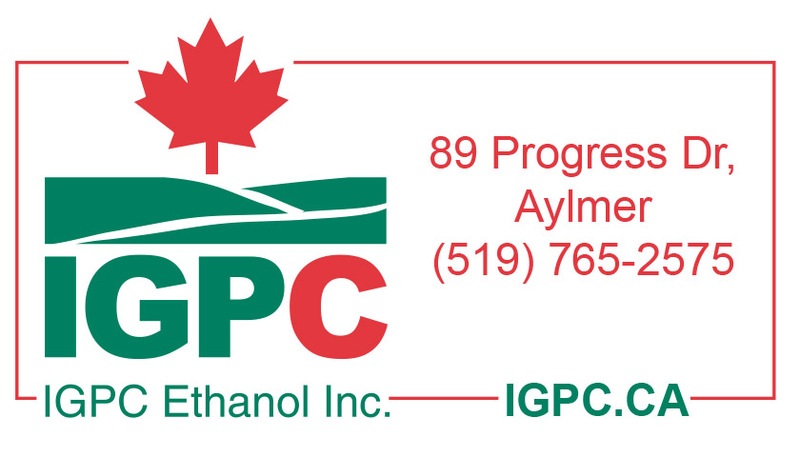 We hope you will stop by and say hello this weekend at the East Elgin Community Complex for the Aylmer Home, Garden & Rec Show. Everyone welcome! Thank you to our top donors in 2016. Without your support we could have have granted out over $21,000 to local projects and organizations! Join us for the lighting of the parks, Friday November 25th starting at 6:30pm. 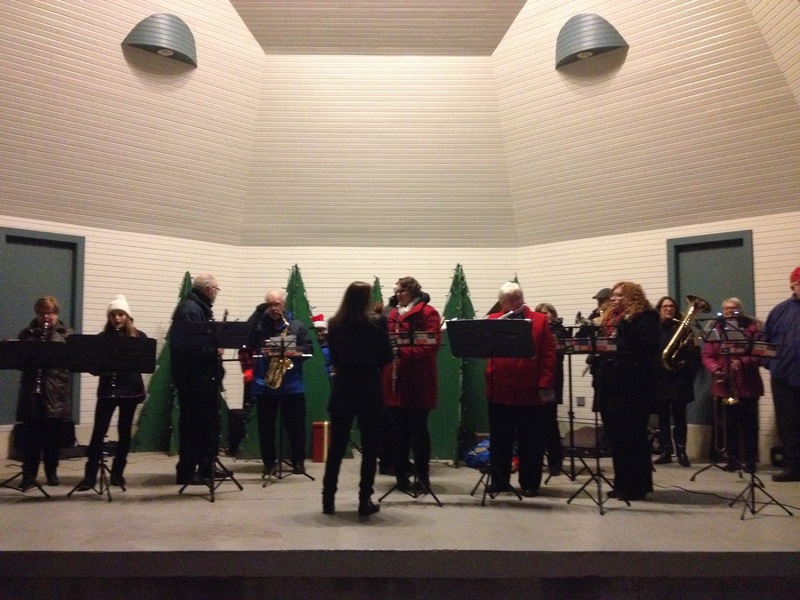 The Aylmer Area Community Band will take us on a musical journey through our favourite Christmas carols. 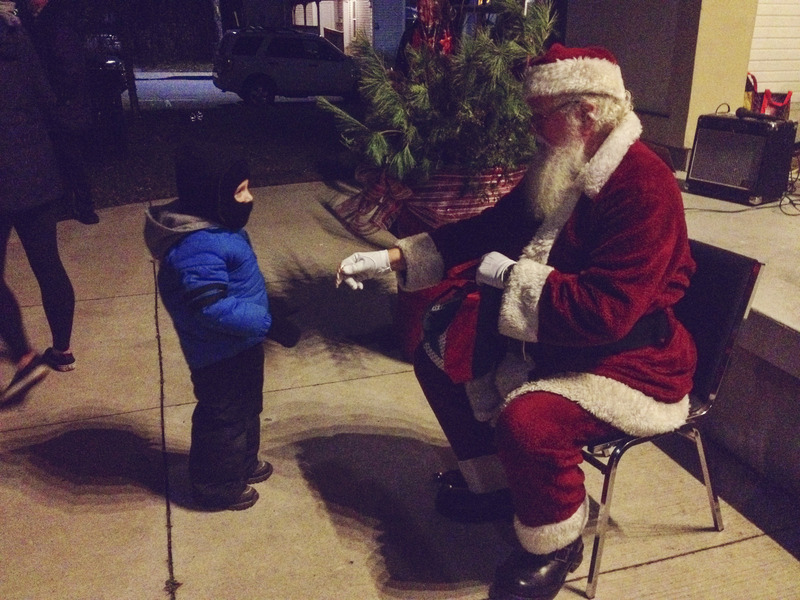 Santa will visit for your photographs and you are invited to walk throughout the parks enjoying the decorations. Members of the Royal Bank of Canada will be handing out free hot chocolate and treats will also be available. To kick off Canada’s 150th celebration, Balmoral Park will be decorated in red and white lights to celebrate the monumental occasion. Thank you to Canada150 grant to the Aylmer BIA to make this event possible.